North Carolina Masonic Mutual Life Insurance Co.
St. John’s Lodge in New Bern, part of The Grand Lodge of Ancient, Free and Accepted Masons of North Carolina, has contributed more materials to DigitalNC, including minute books from the 1850s to 1910s, life insurance certificates from the 1860s, an inventory, and rosters. These materials give insight into the life of the Freemasons in the mid to late 19th century. The life insurance certificates from the North Carolina Masonic Mutual Life Insurance Company reveal the names and residences of many members, which can be useful for genealogy research. Additionally, the Grand Lodge has provided letters written to D.H. Hill, a Confederate General during the Civil War, which are a useful resource for anyone interested in Civil War history. The Southern Historical Collection in Wilson Library at UNC-Chapel Hill contains papers of D. H. Hill, which can be viewed at their site. You can learn more about The Grand Lodge of Ancient, Free and Accepted Masons of North Carolina from their contributor page, past blog posts, and their website. Salem Academy and College contributed two scrapbooks and several newspaper issues to DigitalNC. 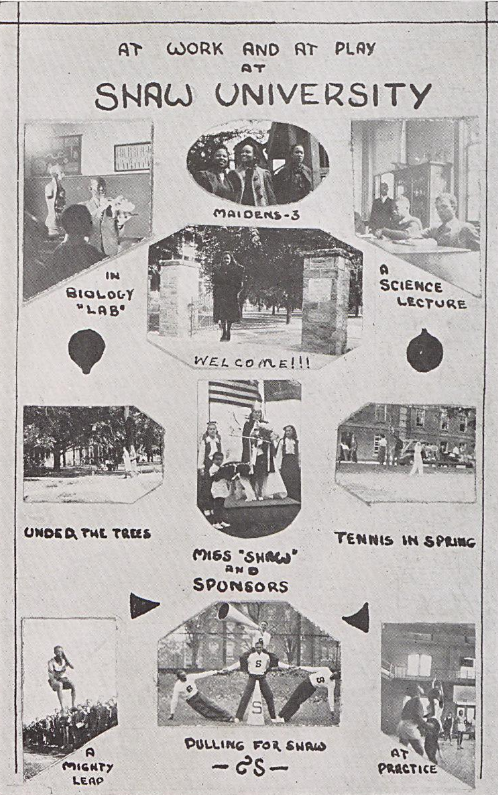 The issues of The Salemite, the Salem College student newspaper, fill in the gaps of previously digitized newspapers, extending from 1920 to 1990. One of the scrapbooks is the Salem College Glee Club scrapbook from the 1974 to 1975 school year. It includes Glee Club related materials such as programs, newspaper clippings, photos, letters, and cards. 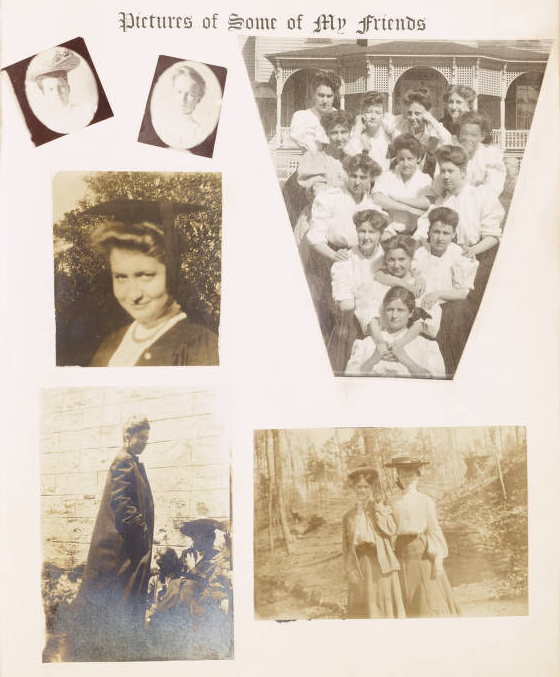 The other is the College Girls’ Record, Compiled and Illustrated by Virginia Woodson Frame, a scrapbook that a student at Salem Academy and College filled in, wrote in, and added photographs to, showing her experience at Salem in 1906. You can learn more about Salem Academy and College from their contributor page as well as their website. Three new yearbooks from Shaw University are now available on DigitalNC. Founded in 1865, Shaw was the first college established for African Americans in the South. Shaw has often been called the mother of African American colleges in NC, as the founding presidents of three other NC HBCUs were all alums of Shaw. 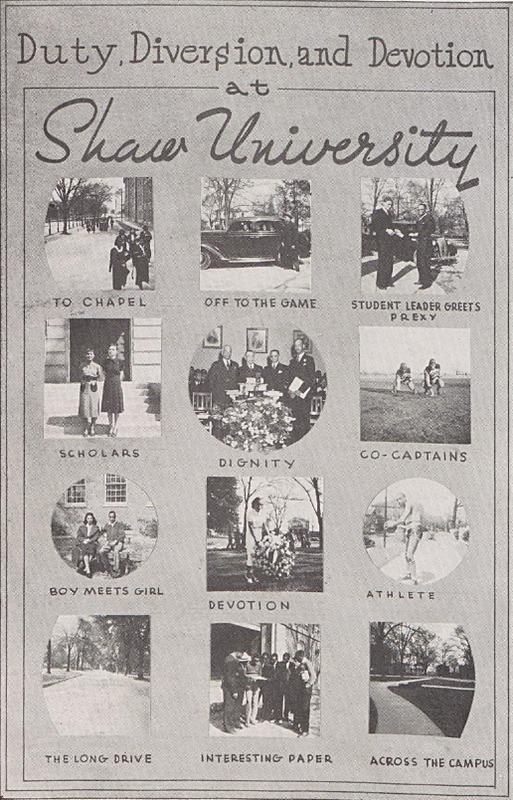 The Shaw University Journal: Commencement Number  is the earliest yearbook from Shaw University now available on DigitalNC, but Shaw has shared campus publicans dating back to 1882. To learn more about Shaw University, please visit their contributor page or the website. 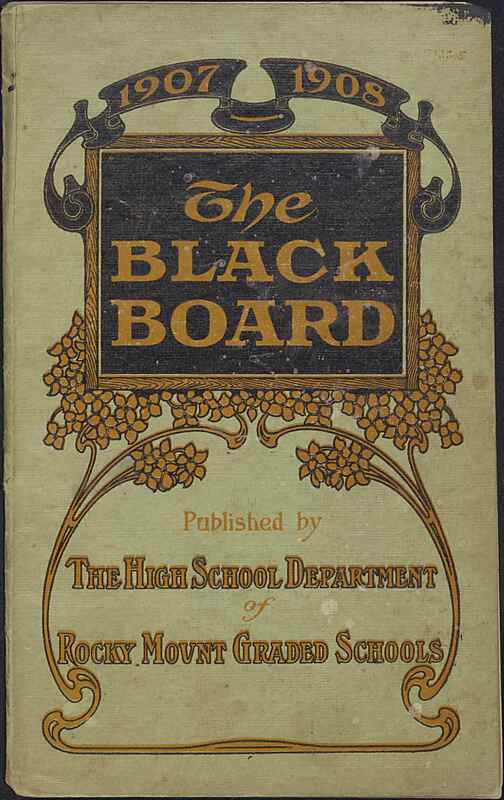 To see all of the yearbooks available from the North Carolina Yearbooks Collection, please visit the following link. The Constance Matthews Collection exhibit from the Braswell Memorial Library in Rocky Mount is now available on DigitalNC! 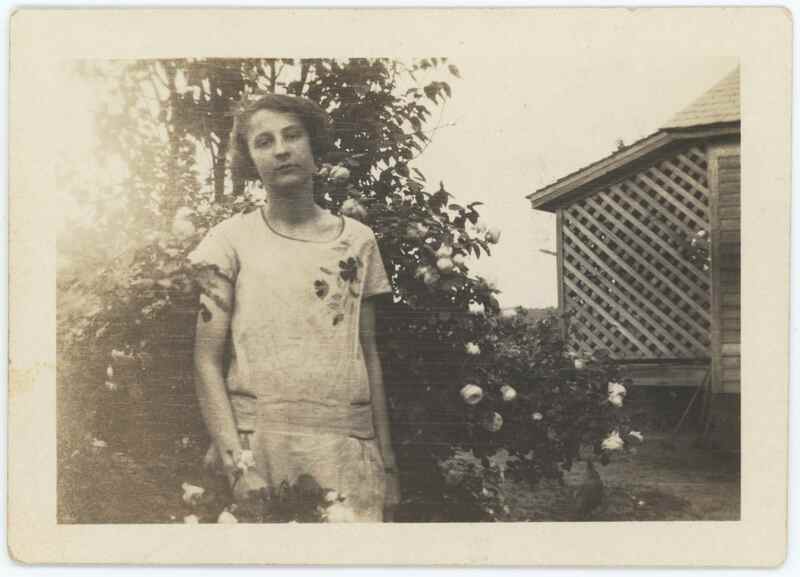 Constance Matthews (1912-1940) was an interesting young woman who grew up in Spring Hope, North Carolina and was an active member of the Nash County Community. Matthews was the only child of Mattie Lou Bolton Matthews and John C. Matthews, a prominent postmaster and businessman. A graduate of the North Carolina College for Women in Greensboro (now UNC-Greensboro), she was also the founder of the Spring Hope Alumnae Club. Matthews was most notably known for being an active writer and the editor of the Nash County News in Spring Hope. She was one of the first female newspaper editors in the area during the early twentieth century. You can view some of Constance Matthew’s editing work on DigitalNC. Several issues of the Nash County News are available in the North Carolina Newspapers Collection. The genealogist Annie Pearl Brantley of Spring Hope acquired the Matthew family photos and gave them to the Braswell Memorial Library (Rocky Mount, N.C.). 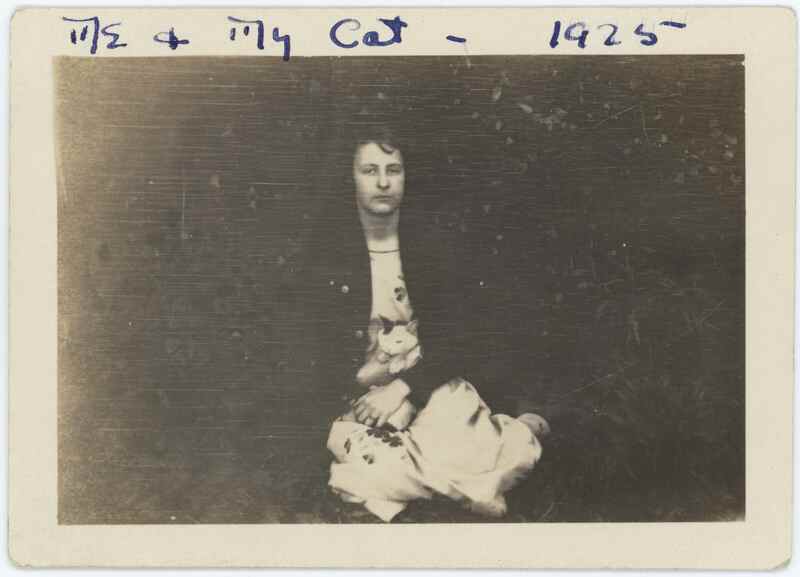 A selection of photographs of Constance, her friends and family, and her activities are now available on DigitalNC, capturing a glimpse into the short life of a remarkable woman. To learn more about Constance Matthews and see the full collection, please visit the exhibit page. To learn more about the Braswell Memorial Library in Rocky Mount, please visit the contributor page or the website. The header of the Grand Lodge Certificate establishing Army Lodge A. New materials from The Grand Lodge of Ancient, Free and Accepted Masons of North Carolina have been digitized and added to DigitalNC. The materials include minute books, petitions, bylaws, correspondence, ledgers, and memberships of lodges in North Carolina as well as a few in Tennessee. There are also early issues of The Masonic Journal, a Masonic newspaper from Greensboro dating from the late 19th century. 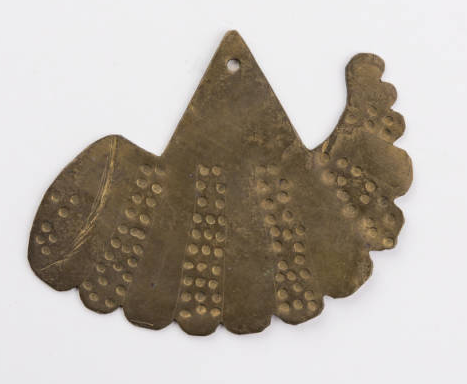 Several physical objects have also been digitized, including brass working tools, a pouch they were stored in, a canvas bag, and ballot tokens. You can view the books and papers under memorabilia and the objects and membership album in images. The newspaper is now part of our extensive North Carolina Newspapers collection. The North Carolina Freemasons come from a long tradition of European stonemasons and construction workers who formed guilds to keep secret their trade practices in areas such as math and construction. After the Renaissance, Freemasons transformed into a fraternal organization. The tools such as the ones we have digitized were used to represent personal growth and enlightenment by the members. It was in this form that Freemasonry came to North Carolina in the mid-eighteenth century and the first lodge was established in Raleigh in 1792. You can view more from the Grand Lodge through their contributor page. Browse through the collection in images, memorabilia, or newspapers. Additionally, you can learn more about the Grand Lodge through their website and previous blog posts. Brass tool from Army Lodge A made from spent German shell casings, circa 1917. 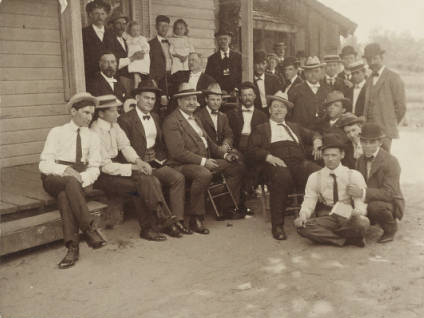 Members of Raleigh Lodge No. 500, circa 1900. When people ask me to sum up the Digital Heritage Center, I usually tell them what we do. We provide digitization and digital publishing services to cultural heritage institutions throughout North Carolina. And DigitalNC.org has some pretty healthy stats to back it up. Beyond this, the site receives about 280,000 pageviews per month, 58% of which come from users in North Carolina. That’s a lot of our state’s history being shared online, 24/7. Since opening its doors in 2009, the Digital Heritage Center is showing the nation that North Carolina has a strong and collaborative cultural heritage community. This state has so many deep, rich, compelling — and quirky collections. They are stewarded by staff who have a passion for preservation, and a genuine love of providing access to users near and far. We are proud to be a part of that community, offering many institutions the opportunity to bring their collections to a broader audience for the first time. We hope you will take the chance to explore the map above, and DigitalNC.org. And we hope that you’ll find a contributing institution in your area and stop in. Thanks for reading, and for your support. And here’s to 200 more. 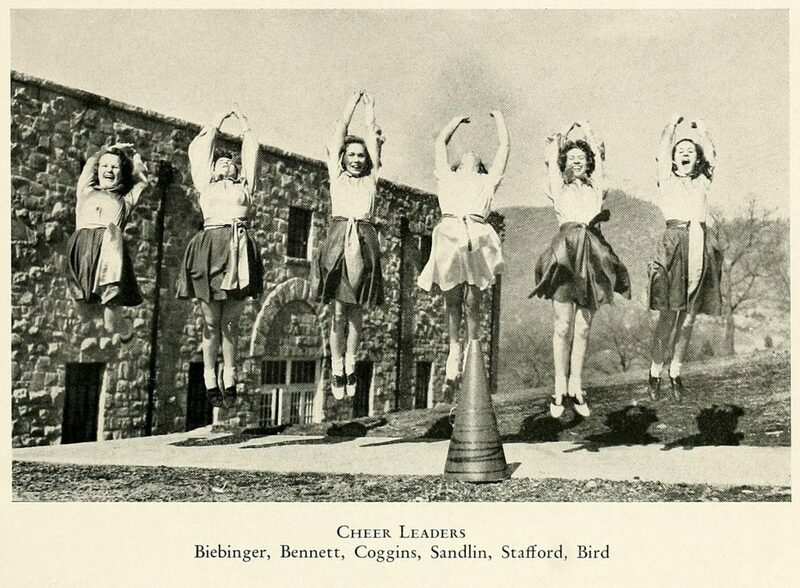 Cheerleaders, From Western Carolina University’s 1940 edition of the Catamount yearbook. New materials from Ocracoke Preservation Society have been digitized and added to DigitalNC. The materials include photographs and film negatives, showing the Ocracoke community during the mid to late twentieth century, including schools, athletics, fishing, events, and people. There is also a collection of materials from Franklin Miller Cochran, a pilot and writer of Ocracoke Island. He flew passengers between the island and mainland North Carolina and wrote extensively about his experience as a pilot and citizen of the Outer Banks. His largest manuscript, The Outer Banks — Today and Yesterday, is about the history of the Outer Banks. Additionally, correspondence between Cassius M. Clay and several citizens of Ocracoke has been digitized. Other ephemera, such as brochures, maps, business cards, and post cards are also in the collection. 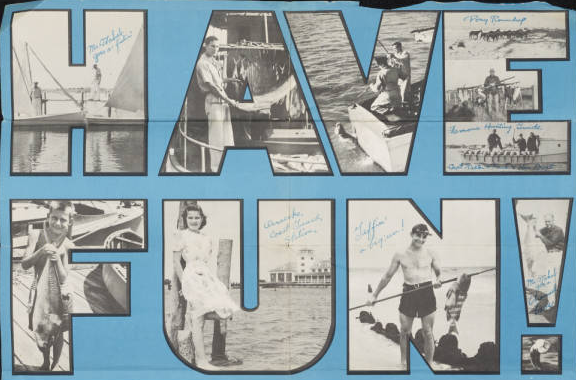 Learn more from our past blog post about Ocracoke and the scrapbooks we digitized. You can see more from Ocracoke Preservation Society on their contributor page or their website. 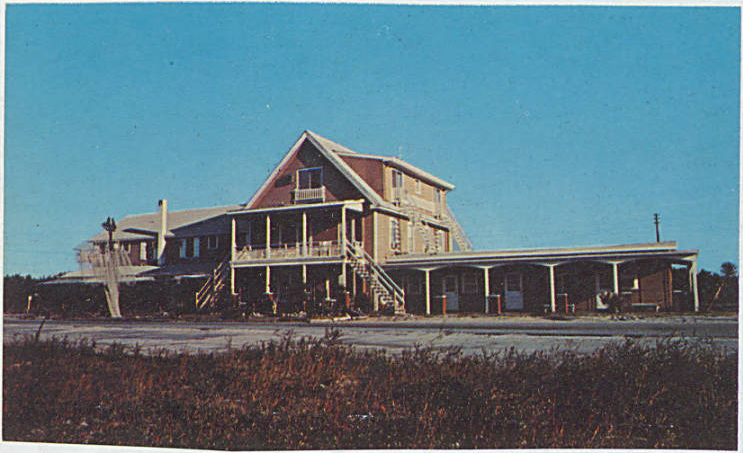 The Island Inn, Ocracoke, N.C.
A Decade of Book Club Annoucements now Online! Thanks to the Wilson County Public Library, a decade of Annual Announcements from the Book Club of Wilson are now available on DigitalNC! Book Clubs are not a new trend and these items prove it! Domestic book clubs originated in England during the 18th century, as women pushed for intellectual autonomy (Heller). 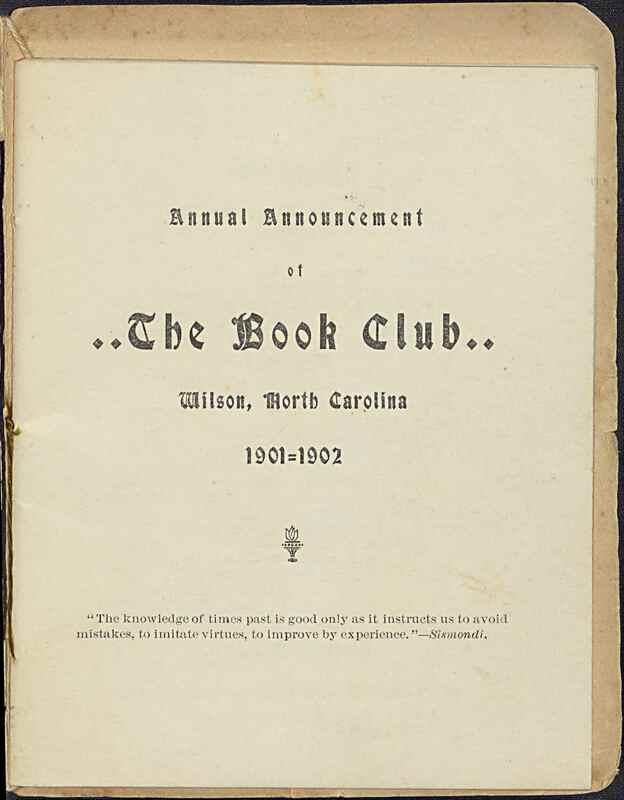 The Book Club of Wilson began in 1898 with a group of women who selected readings for monthly discussion. They met in each others’ homes and discussed about half a dozen pieces each month. Dating from 1901-1911, these announcements cover a variety of topics, including Shakespeare, U.S. social issues, and romance in Scotland. These resources could be useful for researchers interested in women’s education in the early twentieth century, especially outside of the traditional school system. They could also be a fun project or starting point for beginning a book club of your own! In addition to the book club announcements, Wilson County Public Library also contributed a copy of a baseball Score Card from 1923. This booklet contains photographs and advertisements centering on baseball in Wilson County during the early 1920’s. To learn more about Wilson County Public Library visit the contributor page or the website. The latest batch of items from the Rockingham County Public Library contains several scrapbooks that document the history of several branch libraries in the county. A highlight from this group is the General Publicity scrapbook, which documents a history of activism for libraries in both Rockingham County and around the state– especially through bookmobiles. The first bookmobile came to North Carolina in 1936 to serve the largely rural population that had little access to library services within their communities. At the time, the North Carolina Library Association (NCLA) and the Citizens’ Library Movement estimated that more than 1 million people in NC had no access to libraries. NCLA combated this problem by purchasing the state’s first book truck. The truck traveled around to rural counties in the state, demonstrating how small, local libraries could better serve their populations. This idea quickly caught on in Rockingham County and a community member donated a bookmobile to the county in 1937 (pictured above). The new bookmobile was widely successful, making 106 stops weekly around the county. It ran as the soul “locomotive library” for more than a decade before it was replaced by another, more unusual edition in 1949. The second book truck (pictured at left) featured machine-powered shelves that extended several feet behind the truck, which allowed space for more than 1200 volumes of books. This was more than double the amount of the previous truck. The popularity of the bookmobile grew so rapidly that the county added a second bookmobile to the fleet in 1953. 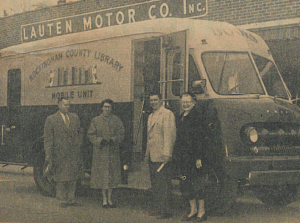 The newest model was a refurbished delivery truck that was as large as a “room on wheels.” The new, larger bookmobile (pictured below) allowed for the library to better serve rural patrons, no matter the weather, which had been a problem for the previous model. 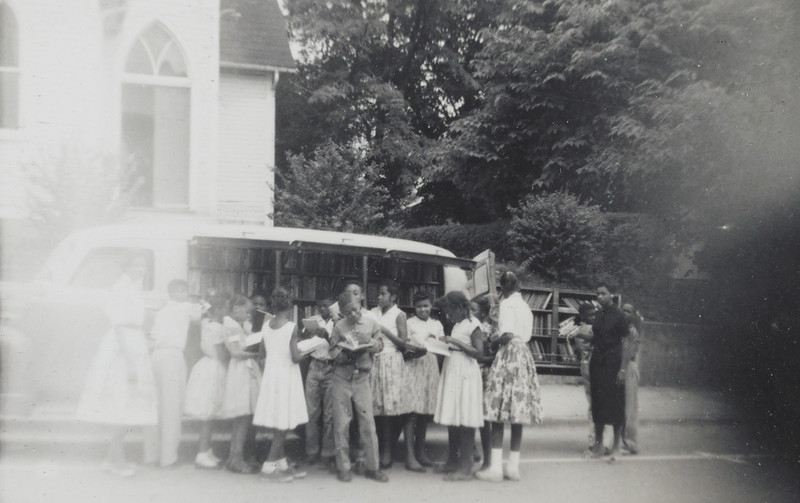 The older bookmobile went on to serve the McRae Libraries in Rockingham County, which served the African American community (featured photo at the top of the page), providing access to a previously under-served population in the county. The McRae Library scrapbook also offers a look into the vibrant history of library services for the black community in Rockingham County. If you are interested in learning more about the Rockingham County Bookmobile, check out this unique film from 1939. It demonstrates the first bookmobile in action! In addition to the scrapbooks containing information about the bookmobiles, this batch also includes several informational booklets about various textile mills in the county, various memorabilia items, and historical information about the area from the early nineteenth century. To learn more about the Rockingham County Public Library and its branches, please the website. To see more items from the library on DigitalNC, please visit their contributor page.